Note The little intro and interlude riff has not been tested. Its only supposed to be one strum through the chords on the intro right? Lead singers Jacob Hemphill (vocals, guitar) and Bob Jefferson (bass) met in first grade in Virginia, shortly after Jacob had returned from living in Africa with his family. The two instantly became best friends, and in middle school found a common love for hip hop and rock music. 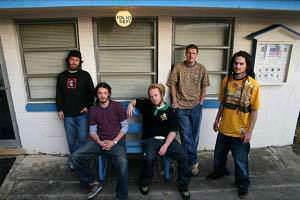 Throughout middle and high school, they met Patrick O’Shea (keyboards), Ryan Berty (drums), and Ken Brownell (percussion) – who would later form SOJA. .